I am not a jewelry person. I seldom buy any, but I’ve inherited some from my mother and my sister Karin. Rings bracelets… are scattered around the house. Whenever one of them gets my attention, I would wear that piece for a couple of days. Yesterday I happened to see a jewelry box in my closet. Opening it, I saw Mom’s jade ring. “I’ll show you,” Mom said and disappeared in her walk-in closet. Few minutes later, she came back with a ring. I took a peek at it. “It’s nice,” I said, trying not show any excitement. Mom had many ugly rings: one pearl ring that had a broken pearl on it, one with a bloody red unknown stone on the top… We didn’t have a lot of money; she couldn’t afford expensive ones; every ring was a treasure for her. And this Taiwan Jade Ring was probably the ugliest. “Do you want it?” Mom looked at me, clearly expecting me to say yes. “No, thank you.” I said matter-of-factly. There was no way I would let my sister Yvonne see me wearing this ugly thing. I could almost hear her snickering. I got a little nervous. “Look at my fingers! I don’t wear rings, Mom. Give it to Yvonne. Yvonne loves jewelry,” I said, smiling broadly. I could almost see Yvonne’s face when Mom put the ring in her hand. “Yvonne is picky. She wouldn’t want it,” Mom said. But, I don’t want it either, I thought. Rings were useless for me, but something on Mom’s face stopped me rejecting this ring. “I love it. Thank you,” I said and put the ring in my pocket, praying that Yvonne would never see me wearing it. The dark green oval-shape jade is about the size of a dime. 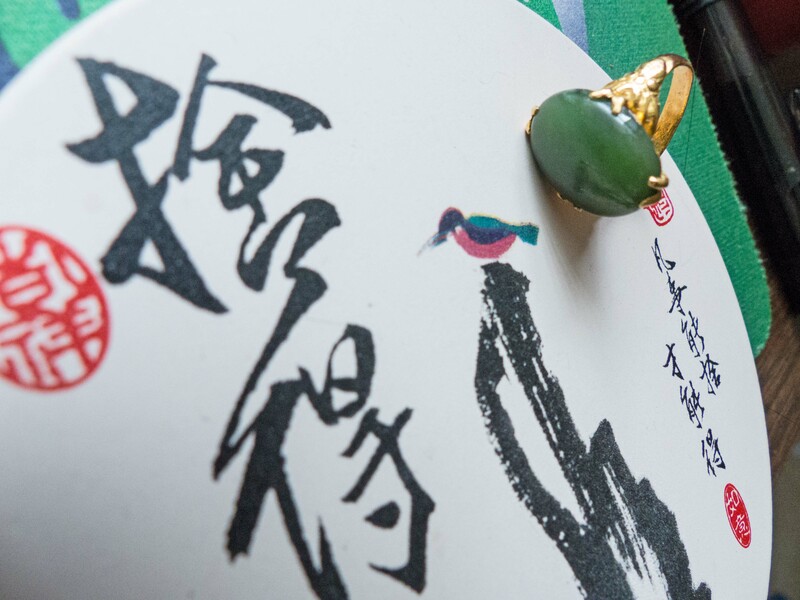 The gold band has a smooth surface at the bottom, but near jade stone, it is carved with leaves and fruits with four extended golden claws holding the jade. I have never told Yvonne about my jade ring. It’s not just a ring; it is Mom’s love. And I can feel it. This entry was posted in Memoir, Writing 101. Bookmark the permalink. I suspect if you have it appraised, you’ll be proud to wear it. I think it’s lovely. BTW, you’re a good writer. The ring is lovely, and being your mother’s gift, it’s a treasure for you.